Rudie will recognise Bobby Sarkie from The Tartans and The Immortals (not to mention his solo roots killer "Better World"). His singing here is expertly reined in by desolation, numbness and regret, over a hollowed-out, mesmeric rhythm, with some nasty synth-work and casually brilliant effects on the drums. The vocal cut is more than a minute longer than the version which opens the "Jah Son Invasion" album with such a flourish; and the mix is different, with more prominent keys, and toned-down bass. It’s previously unreleased, like the dub. The B-side is booby-trapped with sensational instrumental excursions on Junior Delahaye’s "Working Hard For The Rent Man" and Jackie Mittoo’s almighty "Drum Song", which conclude the same original tape-reel as Over And Over. Rent Rebate features masterful, boppish soprano saxophone-playing by Roland Alphonso, and restrained guitar interjections by Barry Vincent, with a Spanish tang. The superb hand-drumming on Mount Zion is by Ras Menelik; and it’s Mittoo himself on organ (or just maybe Clive Hunt, Wackies can’t quite remember). Matt says: My favourite reggae reissue label bar none. Lord Wachie turns his attention to Bobbie Sarkie. 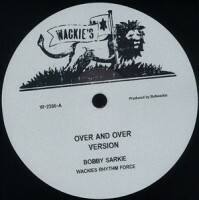 As usual, I'll be headin' straight to the dubs, "Over and Over Version" a particularly heady offering.